We believe that global poverty and injustice are actively produced, political and preventable. Inequality produces global power divides which drive poverty and environmental crises. As an organisation, we target policies and institutions that entrench these global inequalities, especially trade and aid policies, which often sustain and produce the inequality they purport to prevent. Be a mechanism of global solidarity not a tool for Australia’s national interest. The final outcome of aid should be to remove the need for aid. 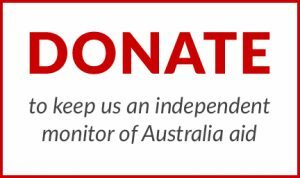 Aid/Watch is an independent, membership-based organisation that campaigns to end the use of aid to further Australia’s economic and security ‘national interests’. We focus on the causes not the symptoms of poverty and inequality, and campaign for aid and development that promotes social and environmental justice. We challenge Australian government agencies, international financial and trade institutions, corporations and NGOs that use aid, trade and other foreign policy mechanisms to undermine the ability of communities in the Global South to determine their own futures. A world free from political and economic inequality, in which aid is no longer necessary and people can determine their own futures within a global framework of mutual respect for one another and for the environment. We are committed to global justice and equality. We campaign as much for our futures as for the futures of others, recognising that they are intertwined. We are respectful of the different approaches and views of others in the movement for global justice. We acknowledge and aim to strengthen the power and agency of communities, those most disadvantaged through structures of power, and those who are silenced or excluded from participating in political and decision making processes. We are driven by our relationships of solidarity with civil society groups, networks and movements in the South. We believe that for change to happen, we must support people most affected in the struggle against injustice and inequality. We are a member-based organisation. We do not take funds from governments or corporations. We are autonomous and independent in our ability to critically comment and are uncompromising in advocating for social and environmental justice. We respect diversity of ideas and work to generate meaningful public dialogue. We are free from commitments to any government, political ideology, religion, or economic interest. Our campaigns are grounded in experience and our research is thorough and constructive. We believe in building alternative futures, founded on experience and on community-level capacity. We are a member-driven activist organisation with connections to other organisations with a common purpose. 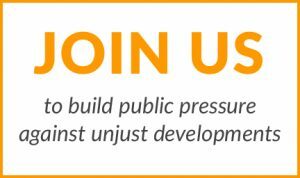 Our campaigns provoke public debate to generate engagement with aid and development issues, and to inspire public participation in efforts to transform development policies and practices.